Closeup of my first re-imagined clipboard! I am in love with (and hate) my newest project - Re-Imagined Clipboards. In my day-job, I run around all day with a boring clipboard (ugly old thing!). It's a neccessity, but did it have to be so boring?? NO! So a bit of imagination, some decoupage glue, a bunch of craft glue, a few bits of jewelry and a heck of a lot of buttons, and a LOT of time later.... I had a MUCH pretty clipboard!! One that my coworkers LOVED too! So this winter break, did I spend most of my time doing Christmas-y things? Nope. I spent hours (and hours and hours) in my work room (aka my garage) freezing my poor tootsies off. I finally completely finished 4 clipboards with 5 more in progress. 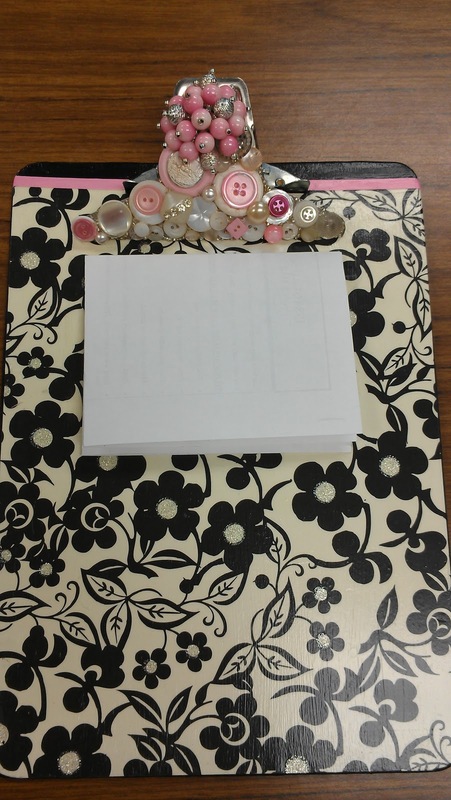 The best thing about these clipboards is almost the whole thing is done with recycled and used items. I found the clipboards at garage sales or thrift stores. The buttons are used or vintage. 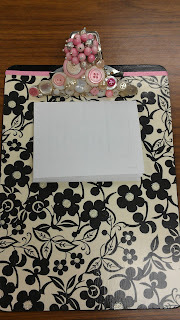 I used scrapbook paper (which I also got at garage sales, thrift stores, or from my old scrapbook supplies), and even the jewelry bits are from old or vintage earrings or necklaces (the white, beaded pom pom thing near the top of #2 is an old clip-on earring!). 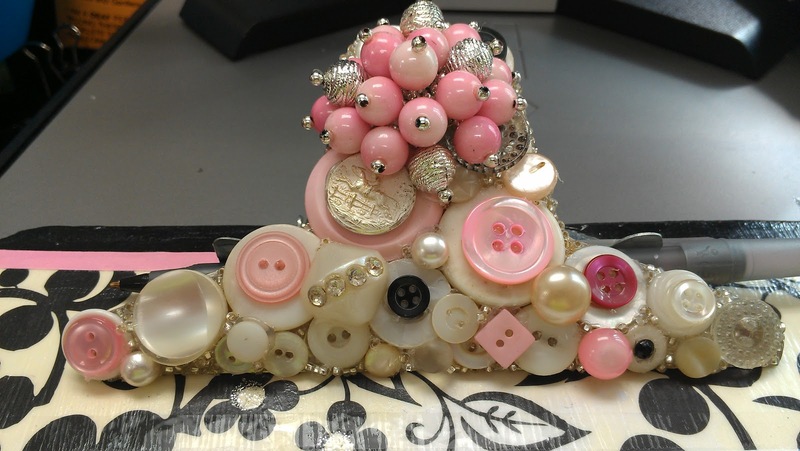 So these awesome clipboards are created from old, cast-off items than nobody else wanted. I am always thrilled when I am able to make something so cool out of things others got rid of!!! I LOVE how they turned out (I want to keep them all!!) and I HATE how much time they take (and ewww... the glue is SUCH a pain to work with and to clean up!!). I am toying with selling them, but will probably have to sell them for cost of supplies and a bit of work - because if I sold them for the amount of hours in each one (even at minimum wage), I'd have to sell them for close to one hundred bucks! Well I may sell a few anyways.. if I can bear to part with them! I had a blast making these (if you ignore the cold and the super-sticky glue messes!). I wish you all happy crafting and may you have a wonderful 2013!!!! Happy New Year! !